Citation(s): 1808 (Google Scholar), 790 (selected). Distributed computer architectures labeled "peer-to-peer" are designed for the sharing of computer resources (content, storage, CPU cycles) by direct exchange, rather than requiring the intermediation or support of a centralized server or authority. Peer-to-peer architectures are characterized by their ability to adapt to failures and accommodate transient populations of nodes while maintaining acceptable connectivity and performance. Content distribution is an important peer-to-peer application on the Internet that has received considerable research attention. Content distribution applications typically allow personal computers to function in a coordinated manner as a distributed storage medium by contributing, searching, and obtaining digital content. In this survey we propose a framework for analyzing peer-to-peer content distribution technologies. Our approach focuses on non-functional characteristics such as security, scalability, performance, fairness, and resource management potential, and examines the way in which these characteristics are reflected in - and affected by - the architectural design decisions adopted by current peer-to-peer systems. We study current peer-to-peer systems and infrastructure technologies in terms of their distributed object location and routing mechanisms, their approach to content replication, caching and migration, their support for encryption, access control, authentication and identity, anonymity, deniability, accountability and reputation, and their use of resource trading and management schemes. A new wave of network architectures labeled peer-to-peer is the basis of operation of distributed computing systems such as Gnutella [Gnu03], Seti@Home [Set03], OceanStore [KBC+00], and many others. Such architectures are generally characterized by the direct sharing of computer resources (CPU cycles, storage, content) rather than requiring the intermediation of a centralized server. The motivation behind basing applications on peer-to-peer architectures derives to a large extent from their ability to function, scale and self-organize in the presence of a highly transient population of nodes, network and computer failures, without the need of a central server and the overhead of its administration. Such architectures typically have as inherent characteristics scalability, resistance to censorship and centralized control, and increased access to resources. Administration, maintenance, responsibility for the operation and even the notion of "ownership" of peer-to-peer systems are also distributed among the users, instead of being handled by a single company, institution or person (see also [Agr03] for an interesting discussion of institutional change through decentralized architectures). Finally peer-to-peer architectures have the potential to accelerate communication processes and reduce collaboration costs through the ad hoc administration of working groups [SF03]. This report surveys peer-to-peer content distribution technologies, aiming to provide a comprehensive account of applications, features, and implementation techniques. As this is a new and (thankfully) rapidly evolving field, and advances and new capabilities are constantly being introduced, this paper will be presenting what essentially constitutes a "snapshot" of the state of the art around the time of its writing - as is unavoidably the case for any survey of a thriving research field. We do however believe that the core information and principles presented will remain relevant and useful for the reader. In the next section we define the basic concepts of peer-to-peer computing. We classify peer-to-peer systems into three categories (communication and collaboration, distributed computation, and content distribution). Content distribution systems are further discussed and categorized. We then present the main attributes of peer-to-peer content distribution systems, and the aspects of their architectural design which affect these attributes are analyzed with reference to specific existing peer-to-peer content distribution systems and technologies. Throughout this report the terms "node", "peer" and "user" are used interchangeably, according to the context, to refer to the entities that are connected in a peer-to-peer network. A quick look at the literature reveals a considerable number of different definitions of "peer-to-peer", mainly distinguished by the "broadness" they attach to the term. The strictest definitions of "pure" peer-to-peer refer to totally distributed systems, in which all nodes are completely equivalent in terms of functionality and tasks they perform. These definitions fail to encompass, for example, systems that employ the notion of "supernodes" (nodes that function as dynamically assigned localized mini-servers) such as Kazaa [Kaz03], which are however widely accepted as peer-to-peer, or systems that rely on some centralized server infrastructure for a subset of non-core tasks (e.g. bootstrapping, maintaining reputation ratings et cetera). According to a broader and widely accepted definition in [Shi00], "peer-to-peer is a class of applications that take advantage of resources-storage, cycles, content, human presence-available at the edges of the internet". This definition, however, encompasses systems that completely rely upon centralized servers for their operation (such as seti@home, various instant messaging systems or even the notorious Napster), as well as various applications from the field of Grid computing. Overall, it is fair to say that there is no general agreement about what "is" and what "is not" peer-to-peer. We feel that this lack of agreement on a definition-or rather the acceptance of various different definitions-is, to a large extent, due to the fact that systems or applications are labeled "peer-to-peer" not because of their internal operation or architecture, but rather as a result of how they are perceived "externally", i.e. whether they give the impression of providing direct interaction between computers. As a result, different definitions of "peer-to-peer" are applied to accommodate the various different cases of such systems or applications. The sharing of computer resources by direct exchange, rather than requiring the intermediation of a centralized server. Centralized servers can sometimes be used for specific tasks (system bootstrapping, adding new nodes to the network, obtain global keys for data encryption), however systems that rely on one or more global centralized servers for their basic operation (e.g. for maintaining a global index and searching through it-Napster, Publius) are clearly stretching the definition of peer-to-peer. 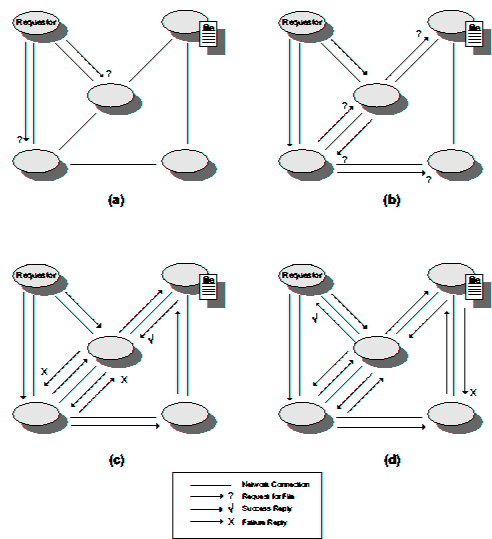 As the nodes of a peer-to-peer network cannot rely on a central server coordinating the exchange of content and the operation of the entire network, they are required to actively participate by independently and unilaterally performing tasks such as searching for other nodes, locating or caching content, routing information and messages, connecting to or disconnecting from other neighboring nodes, encrypting, introducing, retrieving, decrypting and verifying content as well as others. Their ability to treat instability and variable connectivity as the norm, automatically adapting to failures in both network connections and computers, as well as to a transient population of nodes. This fault-tolerant, self-organizing capacity suggests the need for an adaptive network topology that will change as nodes enter or leave and network connections fail or recover, in order to maintain its connectivity and performance. Peer-to-peer systems are distributed systems consisting of interconnected nodes able to self-organize into network topologies with the purpose of sharing resources such as content, CPU cycles, storage and bandwidth, capable of adapting to failures and accommodating transient populations of nodes while maintaining acceptable connectivity and performance without requiring the intermediation or support of a global centralized server or authority. The above definition is meant to encompass "degrees of centralization" ranging from the pure, completely decentralized systems such as Gnutella, to "partially centralized" systems2 such as Kazaa. However, for the purposes of this survey, we shall not restrict our following presentation and discussion of architectures and systems to our own proposed definition, and we will take into account systems that are considered peer-to-peer by other definitions as well, including systems that employ a centralized server (such as Napster, instant messaging applications, and others). The focus of our study is content distribution, a significant area of peer-to-peer systems that has received considerable research attention. Peer-to-peer and Grid computing are two approaches to distributed computing, both concerned with the organization of resource sharing in large-scale computational societies. Grids are distributed systems that enable the large-scale coordinated use and sharing of geographically distributed resources, based on persistent, standards-based service infrastructures, often with a high-performance orientation [FKT01]. As Grid systems increase in scale, they begin to require solutions to issues of self-configuration, fault tolerance, and scalability, in which peer-to-peer research has much to offer. Peer-to-peer systems, on the other hand, focus on dealing with instability, transient populations, fault tolerance, and self-adaptation. To date, however, peer-to-peer developers have worked mainly on vertically integrated applications, rather than seeking to define common protocols and standardized infrastructures for interoperability. In summary, one can say that "Grid computing addresses infrastructure but not yet failure, whereas peer-to-peer addresses failure but not yet infrastructure" [FI03]. In addition to this, the form of sharing initially targeted by peer-to-peer has been of limited functionality-providing a global content distribution and file sharing space lacking any form of access control. As peer-to-peer technologies move into more sophisticated and complex applications, such as structured content distribution, desktop collaboration and network computation, it is expected that there will be a strong convergence between peer-to-peer and Grid computing [Fos00]. The result will be a new class of technologies combining elements of both peer-to-peer and Grid computing, which will address scalability, self-adaptation and failure recovery, while at the same time providing a persistent and standardized infrastructure for interoperability. Peer-to-peer architectures have been employed for a variety of different application categories, which include the following. This category includes systems that provide the infrastructure for facilitating direct, usually real-time, communication and collaboration between peer computers. Examples include chat and instant messaging applications, such as Chat/Irc, Instant Messaging (Aol, Icq, Yahoo, Msn), and Jabber [Jab03]. This category includes systems whose aim is to take advantage of the available peer computer processing power (CPU cycles). This is achieved by breaking down a computer-intensive task into small work units and distributing them to different peer computers, which execute their corresponding work unit and return the results. Central coordination is invariably required, mainly for breaking up and distributing the tasks and collecting the results. Examples of such systems include projects such as Seti@home [SIWB+97,Set03], genome@home [LSP03,Gen03], and others. A number of different applications based on peer-to-peer infrastructures have emerged for supporting a variety of internet services. Examples of such applications include peer-to-peer multicast systems [VBB+03,CDKR02], internet indirection infrastructures [SAZ+02], and security applications providing protection against denial of service or virus attacks [KVR02,JWZ03,VATS04]. Considerable work has been done on designing distributed database systems based on peer-to-peer infrastructures. Bernstein et al. [BGK+02] propose the Local Relational Model (LRM), in which the set of all data stored in a peer-to-peer network is assumed to be comprised of inconsistent local relational databases interconnected by sets of "acquaintances" that define translation rules and semantic dependencies between them. PIER [HHLTL03] is a scalable distributed query engine built on top of a peer-to-peer overlay network topology that allows relational queries to run across thousands of computers. The Piazza system [HIMT03] provides an infrastructure for building semantic web [BLHL01] applications consisting of nodes that can supply either source data (e.g. from a relational database), schemas (or ontologies) or both. Piazza nodes are transitively connected by chains of mappings between pairs of nodes, allowing queries to be distributed across the Piazza network. Finally Edutella [NWQ+03] is an open-source project that builds on the W3C metadata standard RDF, to provide a metadata infrastructure and querying capability for peer-to-peer applications. Most of the current peer-to-peer systems fall within the category of content distribution, which includes systems and infrastructures designed for the sharing of digital media and other data between users. Peer-to-peer content distribution systems range from relatively simple direct file sharing applications, to more sophisticated systems that create a distributed storage medium for securely and efficiently publishing, organizing, indexing, searching, updating, and retrieving data. There are numerous such systems and infrastructures, some examples of which are: the late Napster, Publius [WAL00], Gnutella [Gnu03], Kazaa [Kaz03], Freenet [CSW00], MojoNation [Moj03], Oceanstore [KBC+00], PAST [DR01], Chord [SMK+01], Scan [CKK00], FreeHaven [DFM00], Groove [Gro03], and Mnemosyne [HR02]. This survey will focus on content distribution, one of the most prominent application areas of peer-to-peer systems. In its most basic form a peer-to-peer content distribution system creates a distributed storage medium that allows the publishing, searching and retrieval of files by members of its network. As systems become more sophisticated, non-functional features may be provided, including provisions for security, anonymity, fairness, increased scalability and performance, as well as resource management and organization capabilities. All of these will be discussed in the following sections. These systems are targeted towards simple, one-off file exchanges between peers. They are used for setting up a network of peers and providing facilities for searching and transferring files between them. These are typically light-weight applications that adopt a best effort approach without addressing security, availability and persistence. It is mainly systems in this category that are responsible for spawning the reputation (and in some cases notoriety) of peer-to-peer technologies. These systems are targeted towards creating a distributed storage medium in-and through-which users will be able to publish, store and distribute content in a secure and persistent manner. Such content is meant to be accessible in a controlled manner by peers with appropriate privileges. The main focus of such systems is security and persistence, and often the aim is to incorporate provisions for accountability, anonymity and censorship resistance, as well as persistent content management (updating, removing, version control) facilities. Any peer-to-peer content distribution system relies on a network of peers within which requests and messages must be routed with efficiency and fault tolerance, and through which peers and content can be efficiently located. Different infrastructures and algorithms have been developed to provide such services. Peer-to-peer based infrastructure systems have been designed with the explicit aim of providing user anonymity. In a peer-to-peer network there is no central organization to maintain reputation information for users and their behavior. Reputation information is therefore hosted in the various network nodes. In order for such reputation information to be kept secure, up-to-date, and available throughout the network, complex reputation management infrastructures need to be employed. A dynamic, scalable, efficient content distribution network. Provides dynamic content replication. A censorship-resistant system for publishing content. Static list of servers. Enhanced content management (update and delete). Internet communications software for direct real-time peer-to-peer interaction. A flexible system for anonymous storage. Distributed anonymous information storage and retrieval system. Distributed file storage. Fairness through the use of currency mojo. An architecture for global scale persistent storage. Scalable, provides security and access control. System of networked computers. Donate storage in exchange for the right to publish data. Peer-to-peer steganographic storage system. Provides privacy and plausible deniability. Large scale persistent peer-to-peer storage utility. A censorship-resistant document publishing system. A content publishing system based on document entanglements. Table 1: A classification of current peer-to-peer systems. RM: Resource Management; CR: Censorship Resistance; PS: Performance and Scalability; SPE: Security, Privacy and Encryption; A: Anonymity; RA: Reputation and Accountability; RT: Resource Trading. A scalable peer-to-peer lookup service. Given a key, it maps the key to a node. Scalable content addressable network. A distributed infrastructure that provides hash-table functionality for mapping file names to their locations. Infrastructure for fault-tolerant wide-area location and routing. A scalable peer-to-peer lookup service based on the XOR metric. A peer-to-peer decentralized anonymous network layer. A Distributed reputation management algorithm. A partially distributed approach based on a debit/credit or debit-only scheme. A decentralized, feedback-based reputation management system using satisfaction and number of interaction metrics. Table 2: A classification of current peer-to-peer infrastructures. In this survey we present a description and analysis of applications, systems and infrastructures that are based on peer-to-peer architectures and aim at either offering content distribution solutions or supporting content distribution related activities. providing an account, analysis and evaluation of the design features and solutions that have been adopted by current peer-to-peer systems, as well as their shortcomings, potential improvements and proposed alternatives. For the identification of the non-functional characteristics on which our study is based we used the work of Shaw and Garlan [SG95], which we adapted to the field of peer-to-peer content distribution. The various design features and solutions that we examine, as well as their relationship to the relevant non-functional characteristics, were assembled through a detailed analysis and study of current peer-to-peer content distribution systems that are either deployed, researched or proposed. The resulting analysis framework is illustrated in Figure 1 and described below. Safeguarding the accuracy and completeness of data and processing methods. Unauthorized entities cannot change data; adversaries cannot substitute a forged document for a requested one. Ensuring that data is accessible only to those authorized to have access and that there is control over what data is collected, how it is used and how it is maintained. Ensuring that authorized users have access to data and associated assets when required. For a peer-to-peer content distribution system this often means always. This property entails stability in the presence of failure or changing node populations. Scalability. Maintaining the system's performance attributes independent of the number of nodes or documents in its network. A dramatic increase in the number of nodes or documents will have minimal effect on performance and availability. Performance. The time required for performing the operations allowed by the system, typically publication, searching and retrieval of documents. Fairness. Ensuring that users offer and consume resources in a fair and balanced manner. May rely on accountability, reputation and resource trading mechanisms. Resource Management Capabilities. In their most basic form peer-to-peer content distribution systems allow the publishing, searching and retrieval of documents. More sophisticated systems may afford more advanced resource management capabilities such as editing or removal of documents, management of storage space and operations on metadata. Semantic Grouping of Information. An area of research that has attracted considerable attention recently is the semantic grouping and organization of content and information in peer-to-peer networks. Various grouping schemes are encountered, such as semantic grouping based on the content itself, grouping based on locality or network distance, grouping based on organization ties as well as others. The relationships between the above non-functional characteristics are depicted as a UML diagram in Figure 1. The Figure schematically illustrates the relationship between the various design features and the main characteristics of peer-to-peer content distribution systems. The boxes in the center show the design decisions that affect these attributes. We note that these design decisions are mostly independent and orthogonal. We see for example that the performance of a peer-to-peer content distribution system is affected by the distributed object location and routing mechanisms, as well as by the data replication, caching and migration algorithms. Fairness, on the other hand, depends on the system's provisions for accountability and reputation, as well as on any resource trading mechanisms that may be implemented. In the following sections of this survey the different design decisions and features will be presented and discussed based on an examination of existing peer-to-peer content distribution systems and with reference to the way in which they affect the main attributes of these systems, as presented above. A relevant presentation and discussion of various desired properties of peer-to-peer systems can also be found in [Kub03], while an analysis of peer-to-peer systems from the end-user perspective can be found in [Lee03]. The operation of any peer-to-peer content distribution system relies on a network of peer computers (nodes) and connections (edges) between them. This network is formed on top of-and independently from-the underlying physical computer (typically IP) network, and is thus referred to as an "overlay" network. The topology, structure and degree of centralization of the overlay network, and the routing and location mechanisms it employs for messages and content are crucial to the operation of the system, as they affect its fault tolerance, self-maintainability, adaptability to failures, performance, scalability, and security; in short almost all of the system's attributes as laid out in Section 2 (see also Figure 1). Overlay networks can be distinguished in terms of their centralization and structure. All nodes in the network perform exactly the same tasks, acting both as servers and clients, and there is no central coordination of their activities. The nodes of such networks are often termed "servents" (SERVers+clieENTS). The basis is the same as with purely decentralized systems. Some of the nodes, however, assume a more important role, acting as local central indexes for files shared by local peers. The way in which these supernodes are assigned their role by the network varies between different systems. It is important, however, to note that these supernodes do not constitute single points of failure for a peer-to-peer network, since they are dynamically assigned and if they fail the network will automatically take action to replace them with others. In these systems there is a central server facilitating the interaction between peers by maintaining directories of meta-data describing the shared files stored by the peer nodes. Although the end-to-end interaction and file exchanges may take place directly between two peer nodes, the central servers facilitate this interaction by performing the lookups and identifying the nodes storing the files. The terms "peer-through-peer" or "broker mediated" are sometimes used for such systems [Kim01]. Obviously in these architectures there is a single point of failure (the central server). This typically renders them inherently unscalable and vulnerable to censorship, technical failure or malicious attack. The placement of content (files) is completely unrelated to the overlay topology. In an unstructured network, content typically needs to be located. Searching mechanisms range from brute force methods such as flooding the network with propagating queries in a breadth-first or depth-first manner until the desired content is located, to more sophisticated and resource-preserving strategies that include the use of random walks and routing indices (discussed in more detail in Section 3.3.4). The searching mechanisms employed in unstructured networks have obvious implications, particularly in regards to matters of availability, scalability, and persistence. Unstructured systems are generally more appropriate for accommodating highly transient node populations. Some representative examples of unstructured systems are Napster, Publius [WAL00], Gnutella [Gnu03], Kazaa [Kaz03], Edutella [NWQ+03], FreeHaven [DFM00], as well as others. They have emerged mainly in an attempt to address the scalability issues that unstructured systems were originally faced with. In structured networks the overlay topology is tightly controlled and files (or pointers to them) are placed at precisely specified locations. These systems essentially provide a mapping between content (e.g. file identifier) and location (e.g. node address), in the form of a distributed routing table, so that queries can be efficiently routed to the node with the desired content [LRS02]. Structured systems offer a scalable solution for exact-match queries, i.e. queries in which the exact identifier of the requested data object is known (as compared to keyword queries). Using exact-match queries as a substrate for keyword queries remains an open research problem for distributed environments [WMB99]. A disadvantage of structured systems is that it is hard to maintain the structure required for efficiently routing messages in the face of a very transient node population, in which nodes are joining and leaving at a high rate [LRS02]. Typical examples of structured systems include Chord [SMK+01], CAN [RFHK01], PAST [DR01], Tapestry [ZKJ01] et cetera. A category of networks that are in between structured and unstructured are referred to as loosely structured networks. Although the location of content is not completely specified, it is affected by routing hints. A typical example is Freenet [CSW00,CHSW02]. Table III summarizes the categories we outlined, with examples of peer-to-peer content distribution systems and architectures. Note that all structured and loosely structured systems are inherently purely decentralized; form follows function. Table 3: A classification of peer-to-peer content distribution systems and location and routing infrastructures in terms of their network structure, with some typical examples. In the following sections the overlay network topology and operation of different peer-to-peer systems is discussed, following the above classification according to degree of centralization and network structure. Figure 2 illustrates the architecture of a typical hybrid decentralized peer-to-peer system. Figure 2: Typical hybrid decentralized peer-to-peer architecture. A central directory server maintains an index of the metadata for all files in the network. A computer that wishes to join the network contacts the central server and reports the files it maintains. Client computers send requests for files to the server. The server searches for matches in its index, returning a list of users that hold the matching file. 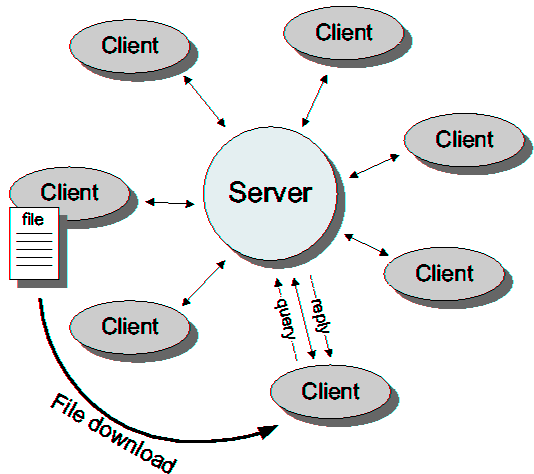 The user then opens direct connections with one or more of the peers that hold the requested file, and downloads it (see Figure 2). The advantage of hybrid decentralized systems is that they are simple to implement and they locate files quickly and efficiently. Their main disadvantage is that they are vulnerable to censorship, legal action, surveillance, malicious attack, and technical failure, since the content shared, or at least descriptions of it and the ability to access it are controlled by the single institution, company or user maintaining the central server. Furthermore, these systems are considered inherently unscalable, as there are bound to be limitations to the size of the server database and its capacity to respond to queries. Large web search engines have however repeatedly provided counterexamples to this notion. Examples of hybrid decentralized content distribution systems include the notorious Napster and Publius systems [WAL00], which rely on a static, system-wide list of servers. Their architecture does not provide any smooth, decentralized support for adding a new server or removing dead or malicious servers. A comprehensive study of the behavior of hybrid peer-to-peer systems and a comparison of their query characteristics and their performance in terms of bandwidth and CPU cycle consumption is presented in [YGM01]. It should be noted that systems that do not fall under the hybrid decentralized category may still use some central administration server to a limited extent, e.g. for initial system bootstrapping (e.g. Mojonation [Moj03]), or for allowing new users to join the network by providing them with access to a list of current users (e.g. gnutellahosts.com for the gnutella network). In this section we examine the Gnutella network [Gnu03], an interesting and representative member of purely decentralized peer-to-peer architectures due to its open architecture, achieved scale and self-organizing structure. FreeHaven [DFM00] is another system using routing and search mechanisms similar to those of Gnutella. Like most peer-to-peer systems, Gnutella builds a virtual overlay network with its own routing mechanisms [RF02], allowing its users to share files with other peers. There is no central coordination of the activities in the network and users connect to each other directly through a software application that functions both as a client and a server (users are referred to as a servents). A request for a certain host to announce itself. Reply to a Ping message. It contains the IP and port of the responding host and number and size of the files being shared. A search request. It contains a search string and the minimum speed requirements of the responding host. Reply to a Query message. It contains the IP, port and speed of the responding host, the number of matching files found and their indexed result set. After joining the Gnutella network (by connecting to nodes found in databases such as gnutellahosts.com), a node sends out a Ping message to any node it is connected to. The nodes send back a Pong message identifying themselves, and also propagate the Ping message to their neighbors. In order to locate a file in unstructured systems such as gnutella, non-deterministic searches are the only option since the nodes have no way of guessing where (at which nodes) the files may lie. The original Gnutella architecture uses a flooding (or broadcast) mechanism to distribute Ping and Query messages: each Gnutella node forwards the received messages to all of its neighbors. The response messages received are routed back along the opposite path through which the original request arrived. To limit the spread of messages through the network, each message header contains a time-to-live (TTL) field. At each hop the value of this field is decremented, and when it reaches zero the message is dropped. The above mechanism is implemented by assigning each message a unique identifier and equipping each host with a dynamic routing table of message identifiers and node addresses. Since the response messages contain the same ID as the original messages, the host checks its routing table to determine along which link the response message should be forwarded. In order to avoid loops, the nodes use the unique message identifiers to detect and drop duplicate messages, to improve efficiency and preserve network bandwidth [Jov00]. Once a node receives a QueryHit message, indicating that the target file has been identified at a certain node, it initiates a download by establishing a direct connection between the two nodes. Figure 3 illustrates an example of the Gnutella search mechanism. Figure 3: An example of the Gnutella search mechanism. Solid lines between the nodes represent connections of the Gnutella network. The search originates at the "requestor" node, for a file maintained by another node. Request messages are dispatched to all neighboring nodes, and propagated from node to node as shown in the four consecutive steps (a) to (d). When a node receives the same request message (based on its unique identifier) multiple times, it replies with a failure message to avoid loops and minimize traffic. When the file is identified, a success message is returned. Scalability issues in the original purely decentralized systems arose from the fact that the use of the TTL effectively segmented the network into "sub-networks", imposing on each user a virtual "horizon" beyond which their messages could not reach [Jov00]. Removing the TTL limit, on the other hand, would result in the network being swamped with messages. Significant research has been carried out to address the above issues, and various solutions have been proposed. These will be discussed in more detail in Section 3.3.4. Partially centralized systems are similar to purely decentralized, but they use the concept of supernodes: nodes that are dynamically assigned the task of servicing a small subpart of the peer network by indexing and caching files contained therein. Peers are automatically elected to become supernodes if they have sufficient bandwidth and processing power (although a configuration parameter may allow users to disable this feature) [Fas03]. Supernodes index the files shared by peers connected to them, and proxy search requests on behalf of these peers. All queries are therefore initially directed to supernodes. Discovery time is reduced in comparison with purely decentralized systems, while there still is no unique point of failure. If one or more supernodes go down, the nodes connected to them can open new connections with other supernodes, and the network will continue to operate. The inherent heterogeneity of peer-to-peer networks is taken advantage of and exploited. In a purely decentralized network all of the nodes will be equally (and usually heavily) loaded, regardless of their CPU power, bandwidth or storage capabilities. In partially centralized systems, however, the supernodes will undertake a large portion of the entire network load, while most of the other (so called "normal") nodes will be very lightly loaded, in comparison (see also [LRS02,ZMK02]). Kazaa is a typical, widely used instance of a partially centralized system implementation (as it is a proprietary system, there is no detailed documentation on its structure and operation). Edutella [NWQ+03] is another partially centralized architecture. Yang and Garcia-Molina [YGM02b,YGM02a] present research addressing the design of and searching techniques for partially centralized peer-to-peer networks. The concept of supernodes has also been proposed in a more recent version of the Gnutella protocol. A mechanism for dynamically selecting supernodes organizes the Gnutella network into an interconnection of superpeers (as they are referred to) and client nodes. When a node with enough CPU power joins the network, it immediately becomes a superpeer and establishes connections with other superpeers, forming a flat unstructured network of superpeers. If it establishes a minimum required number of connections to client nodes within a specified time, it remains a superpeer. Otherwise it turns into a regular client node. A number of methods have been proposed to overcome the original unscalability of unstructured peer-to-peer systems. These have been shown to drastically improve their performance. Lv et al. [LCC+02] proposed to replace the original flooding approach by multiple parallel random walks, whereby each node chooses a neighbor at random and propagates the request only to it. The use of random walks, combined with proactive object replication (discussed in Section 4), was found to significantly improve the performance of the system as measured by: query resolution time (in terms of numbers of hops), per-node query load, and message traffic generated. Proactive data replication schemes are further examined in [CS01]. Yang and Garcia-Molina [YGM02b] suggested the use of more sophisticated broadcast policies, selecting which neighbors to forward search queries to based on their past history, as well as the use of local indices: data structures where each node maintains an index of the data stored at nodes located within a radius from itself. A similar solution to the information retrieval problem is proposed by Kalogeraki et al. [KGZY02] in the form of an Intelligent Search Mechanism built on top of a Modified Random BFS Search Mechanism. Each peer forwards queries to a subset of its neighbors, selecting them based on a profile mechanism that maintains information about their performance in recent queries. Neighbours are ranked according to their profiles and queries are forwarded selectively to the most appropriate ones only. A dynamic topology adaptation protocol that ensures that most nodes will be at a short distance from high capacity nodes. This protocol, coupled with replicating pointers to the content of neighbors, ensures that high capacity nodes will be able to provide answers to a very large number of queries. A search protocol that is based on random walks directed towards high capacity nodes. Simulations of Gia were found to increase overall system capacity by three to five orders of magnitude. Similar approaches, based on taking advantage of the underlying network heterogeneity, are described in [LRS02,ZMK02]. In another approach, Crespo and Garcia-Molina [CGM02b] use routing indices to address the searching and scalability issues. Routing indices are tables of information about other nodes stored within each node. They provide a list of neighbors that are most likely to be "in the direction" of the content corresponding to the query. These tables contain information about the total number of files maintained by nearby nodes, as well as the number of files corresponding to various topics. Three different variations of the approach are presented, and simulations are shown to improve performance by 1-2 orders of magnitude with respect to flooding techniques. Finally the connectivity properties and reliability of unstructured peer-to-peer networks such as Gnutella have been studied in [RF02]. In particular, emphasis was placed on the fact that peer-to-peer networks exhibit the properties of power-law networks, in which the number of nodes with L links is proportional to L-k, where k is a network dependent constant. In other words, most nodes have few links (thus a large fraction of them can be taken away without seriously damaging the network connectivity), while there are a few highly connected nodes which, if taken away, are likely to cause the whole network to be broken down in disconnected pieces. One implication of this is that such networks are robust when facing random node attacks, yet vulnerable to well-planned attacks. The topology mismatch between the Gnutella network and the underlying physical network infrastructure was also documented in [RF02]. Tsoumakos and Roussopoulos [TR03] present a more comprehensive analysis and comparison of the above methods. the network size is not so large as to incur scalability problems [LRS02] (The last issue is alleviated through the various methods described in this Section). The various structured content distribution systems and infrastructures employ different mechanisms for routing messages and locating data. Four of the most interesting and representative mechanisms and their corresponding systems are examined in the following sections. Freenet is a loosely structured system that uses file and node identifier similarity to produce an estimate of where a file may be located, and a chain mode propagation approach to forward queries from node to node. Chord is a system whose nodes maintain a distributed routing table in the form of an identifier circle on which all nodes are mapped, and an associated finger table. CAN is a system using an n-dimensional Cartesian coordinate space to implement the distributed location and routing table, whereby each node is responsible for a zone in the coordinate space. Tapestry (and the similar Pastry and Kademlia) are based on the plaxton mesh data structure, which maintains pointers to nodes in the network whose IDs match the elements of a tree-like structure of ID prefixes up to a digit position. The defining characteristic of loosely structured systems is that the nodes of the peer-to-peer network can produce an estimate (not with certainty) of which node is most likely to store certain content. This affords them the possibility to avoid blindly broadcasting request messages to all (or a random subset) of their neighbors. Instead, they use a chain mode propagation approach whereby each node makes a local decision about which node to send the request message to next. Freenet [CSW00] is a typical purely decentralized loosely structured content distribution system. It operates as a self-organizing peer-to-peer network, pooling unused disk space in peer computers to create a collaborative virtual file system. Important features of Freenet include its focus on security, publisher anonymity, deniability, and data replication for availability and performance. Files in Freenet are identified by unique binary keys. Three types of keys are supported, the simplest of which is based on applying a hash function on a short descriptive text string that accompanies each file as it is stored in the network by its original owner. Each Freenet node maintains its own local data store, which it makes available to the network for reading and writing, as well as a dynamic routing table containing the addresses of other nodes and the files they are thought to hold. To search for a file, the user sends a request message specifying the key and a timeout (hops-to-live) value. A node inserts new data in the network. A key and the actual data (file) are included. A request for a certain file. The key of the file requested is also included. A reply initiated when the requested file is located. The actual file is also included in the reply message. A failure to locate a file. The location (node) of the failure and the reason are also included. New nodes join the Freenet network by first discovering the address of one or more existing nodes, and then starting to send Data Insert messages. To insert a new file in the network, the node first calculates a binary key for the file and then sends a data insert message to itself. Any node that receives the insert message first checks to see if the key is already taken. If the key is not found, the node looks up the closest key (in terms of lexicographic distance) in its routing table, and forwards the insert message to the corresponding node. By this mechanism, newly inserted files are placed at nodes possessing files with similar keys. This continues as long as the hops-to-live limit is not reached. In this way, more than one nodes will store the new file. At the same time, all the participating nodes will update their routing tables with the new information (this is the mechanism through which the new nodes announce their presence to the rest of the network). If the hops-to-live limit is reached without any key collision, an "all clear" result will be propagated back to the original inserter, informing that the insert was successful. If the key is found to be taken, the node returns the pre-existing file as if a request were made for it. In this way, malicious attempts to supplant existing files by inserting junk will end up in the existing files being spread further. If a node receives a request for a locally stored file, the search stops and the data is forwarded back to the requestor. If the node does not store the file that the requestor is looking for, it forwards the request to its neighbor that is most likely to have the file, by searching for the file key in its local routing table that is closest to the one requested. The messages therefore form a chain, as they propagate from node to node. To avoid huge chains, messages are deleted after passing through a certain number of nodes, based on the hops-to-live value they carry. Nodes also store the ID and other information of the requests they have seen, in order to handle "data reply" and "data failed" messages. If a node receives a backtracking "data failed" message from a downstream node, it selects the next best node from its routing stack and forwards the request to it. If all nodes in the routing table have been explored in this way and failed, it sends back a "data failed" message to the node from which it originally received the data request message. If the requested file is eventually found at a certain node, a reply is passed back through each node that forwarded the request to the original node that started the chain. This data reply message will include the actual data, which is cached in all intermediate nodes for future requests. A subsequent request with the same key will be served immediately with the cached data. A request for a similar key will be forwarded to the node that previously provided the data. To address the problem of obtaining the key that corresponds to a specific file, Freenet recommends the use of a special class of lightweight files called "indirect files". When a real file is inserted, the author also inserts a number of indirect files that are named according to search keywords and contain pointers to the real file. These indirect files differ from normal files in that multiple files with the same key (i.e. search keyword) are permitted to exist, and requests for such keys keep going until a specified number of results is accumulated, instead of stopping at the first file found. The problem of managing the large volume of such indirect files remains open. Figure 4 illustrates the use of indirect files. Figure 4: The use of indirect files in Freenet. 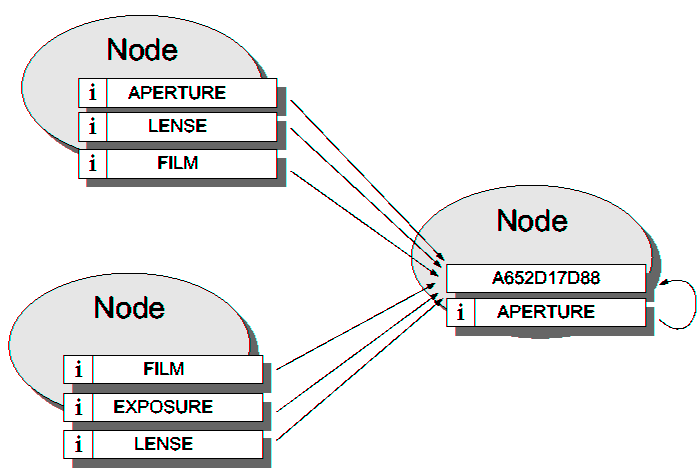 The diagram illustrates a regular file with key "A652D17D88", which is supposed to contain a tutorial about photography. The author chose to insert the file itself, and then a set of indirect files (marked with an i), named according to search keywords she considered relevant. The indirect files are distributed among the nodes of the network; they do not contain the actual document, simply a "pointer" to the location of the regular file containing the document. Nodes tend to specialize in searching for similar keys over time, as they get queries from other nodes for similar keys. Nodes store similar keys over time, due to the caching of files as a result of successful queries. Similarity of keys does not reflect similarity of files. Routing does not reflect the underlying network topology. Chord [SMK+01] is a peer-to-peer routing and location infrastructure that performs a mapping of file identifiers onto node identifiers. Data location can be implemented on top of Chord by identifying data items (files) with keys and storing the (key, data item) pairs at the node that the keys map to. In Chord nodes are also identified by keys. The keys are assigned both to files and nodes by means of a deterministic function, a variant of consistent hashing [KLL+97]. All node identifiers are ordered in an "identifier circle" modulo 2m (Figure SMK+01 shows an identifier circle with m=3). Key k is assigned to the first node whose identifier is equal to or follows k in the identifier space. 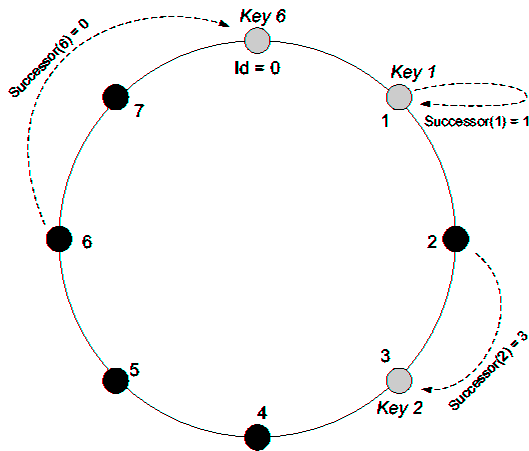 This node is called the successor node of key k. The use of consistent hashing tends to balance load, as each node receives roughly the same number of keys. Figure 5: A Chord identifier circle consisting of the three nodes 0,1 and 3. In this example, key 1 is located at node 1, key 2 at node 3 and key 6 at node 0. The only routing information required is for each node to be aware of its successor node on the circle. Queries for a given key are passed around the circle via these successor pointers until a node that contains the key is encountered. This is the node the query maps to. When a new node n joins the network, certain keys previously assigned to n's successor will become assigned to n. When node n leaves the network, all keys assigned to it will be reassigned to its successor. These are the only changes in key assignments that need to take place in order to maintain load balance. As discussed above, only one data element per node needs be correct for Chord to guarantee correct (though slow) routing of queries. Performance degrades gracefully when routing information becomes out of date due to nodes joining and leaving the system, and availability remains high only as long as nodes fail independently. Since the overlay topology is not based on the underlying physical IP network topology, a single failure in the IP network may manifest itself as multiple, scattered link failures in the overlay [SGG02]. To increase the efficiency of the location mechanism described above-which may in the worst case require traversing all N nodes to find a certain key-Chord maintains additional routing information, in the form of a "finger table". In this table each entry i points to the successor of node n+2i. For a node n to perform a lookup for key k, the finger table is consulted to identify the highest node n� whose ID is between n and k. If such a node exists, the lookup is repeated starting from n�. Otherwise, the successor of n is returned. Using the finger table, both the amount of routing information maintained by each node and the time required for resolving lookups are O(log N) for an N-node system in the steady state. Achord [HW02] is proposed as a variant of Chord that provides censorship resistance by limiting each node's knowledge of the network in ways similar to Freenet (see Section 3.4.1). The CAN ("Content Addressable Network") [RFHK01] is essentially a distributed, internet-scale hash table that maps file names to their location in the network, by supporting the insertion, lookup, and deletion of (key,value) pairs in the table. Each individual node of the CAN network stores a part (referred to as a "zone") of the hash table, as well as information about a small number of adjacent zones in the table. Requests to insert, lookup or delete a particular key are routed via intermediate zones to the node that maintains the zone containing the key. CAN uses a virtual d-dimensional Cartesian coordinate space (see Figure RFHK01) to store (key K,value V) pairs. The zone of the hash table that a node is responsible for corresponds to a segment of this coordinate space. Any key K is therefore deterministically mapped onto a point P in the coordinate space. The (K, V) pair is then stored at the node that is responsible for the zone within which point P lies. For example in the case of Figure RFHK01(a), a key that maps to coordinate (0.1,0.2) would be stored at the node responsible for zone B..
To retrieve the entry corresponding to K, any node can apply the same deterministic function to map K to P and then retrieve the corresponding value V from the node covering P. Unless P happens to lie in the requesting node's zone, the request must be routed from node to node until it reaches the node covering P.
CAN nodes maintain a routing table containing the IP addresses of nodes that hold zones adjoining their own, to enable routing between arbitrary points in space. Intuitively, routing in CAN works by following the straight line path through the Cartesian space from source to destination coordinates. For example in Figure RFHK01(a), a request from node A for a key mapping to point p would be routed though nodes A, B, E, along the straight line represented by the arrow. 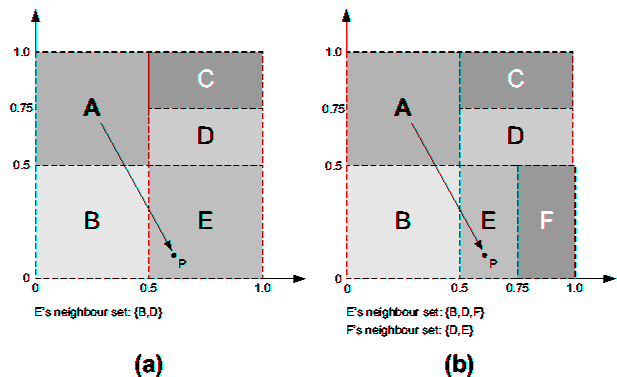 Figure 6: CAN: (a) Example 2-d [0,1]×[0,1] coordinate space partitioned between 5 CAN nodes; (b) Example 2-d space after node F joins. The new node identifies a node already in CAN network, using a bootstrap mechanism as described in [Fra00]. Using the CAN routing mechanism, the node randomly chooses a point P in the coordinate space and sends a JOIN request to the node covering P. The zone is then split, and half of it is assigned to the new node. The new node builds its routing table with the IP addresses of its new neighbors, and the neighbors of the split zone are also notified to update their routing tables to include the new node. When nodes gracefully leave CAN, the zones they occupy and the associated hash table entries are explicitly handed over to one of their neighbors. Under normal conditions, a node sends periodic update messages to each of its neighbors reporting its zone coordinates, its list of neighbors and their zone coordinates. If there is prolonged absence of such an update message, the neighbor nodes realize there has been a failure, and initiate a controlled takeover mechanism. If many of the neighbors of a failed node also fail, an expanding ring search mechanism is initiated by one of the neighboring nodes, to identify any functioning nodes outside the failure region. A list of design improvements is proposed over the basic CAN design described above, including the use of multi-dimensional coordinate space or multiple coordinate spaces for improving network latency and fault tolerance; the employment of more advanced routing metrics such as connection latency and underlying IP topology alongside the Cartesian distance between source and destination; allowing multiple nodes to share the same zone, mapping the same key onto different points; and the application of caching and replication techniques [RFHK01]. Tapestry [ZKJ01] supports the location of objects and the routing of messages to objects (or the closest copies of them, if more than one copies exist in the network) in a distributed, self-administering and fault-tolerant manner, offering system-wide stability by bypassing failed routes and nodes and rapidly adapting communication topologies to circumstances. The topology of the network is self-organizing as nodes come and go and network latencies vary. The routing and location information is distributed among the network nodes; the topology's consistency is checked on the fly, and if it is lost due to failures or destroyed, it is easily rebuilt or refreshed. Tapestry is based on the location and routing mechanisms introduced by Plaxton, Rajamaran and Richa [PRR97], in which they present the Plaxton mesh, a distributed data structure that allows nodes to locate objects and route messages to them across an arbitrarily-sized overlay network while using routing maps of small and constant size. In the original Plaxton mesh the nodes can take on the role of servers (where objects are stored), routers (which forward messages), and clients (origins of requests). Table 4: The neighbor map held by Tapestry node with ID 67493. Each entry in this table corresponds to a pointer to another node. Each node maintains a neighbor map, as seen in the example in table IV. The neighbor map has multiple levels, each level l containing pointers to nodes whose ID must be matched with l digits (the x's represent wildcards). Each entry in the neighbor map corresponds to a pointer to the closest node in the network whose ID matches the number in the neighbor map up to a digit position. For example, the 5th entry for the 3rd level for node 67493 points to the node closest to 67493 in network distance whose ID ends in ..593. Table IV shows an example neighbor map maintained by a node with ID 67493. Figure 7: Tapestry: Plaxton mesh routing example, showing the path taken by a message originating from node 67493 and destined for node 34567 in a Plaxton mesh using decimal digits of length 5. The Plaxton mesh uses a root node for each object, which serves to provide a guaranteed node from which the object can be located. When an object o is inserted in the network and stored at node ns, a root node nr is assigned to it by using a globally consistent deterministic algorithm. A message is then routed from ns to nr, storing at all nodes along the way data in the form of a mapping (object id o, storer id ns). During a location query, messages destined for o are initially routed towards nr, until a node is encountered containing the (o, ns) location mapping. The Plaxton mesh offers: (1) simple fault handling by its potential to route around a single link or node by choosing a node with a similar suffix, and (2) scalability (with the only bottleneck existing at the root nodes). Its limitations include: (1) the need for global knowledge required for assigning and identifying root nodes and (2) the vulnerability of the root nodes. Each node additionally maintains a list of back-pointers, which point to nodes where it is referred to as a neighbor. These are used in dynamic node insertion algorithms to generate the appropriate neighbor maps for new nodes. Dynamic algorithms are employed for node insertion, populating neighbor maps and notifying neighbors of new node insertions. The concept of distance between nodes becomes semantically more flexible, and locations of more than one replica of an object are stored, allowing the application architecture to define how the "closest" node will be interpreted. For example, in the Oceanstore architecture [KBC+00] a "freshness" metric is incorporated in the concept of distance, that is taken into account when finding the closest replica of a document. The use of soft-state to maintain cached content, based on the announce/listen approach [Dee98], is adopted by Tapestry to detect, circumvent and recover from failures in routing or object location. Caches are periodically updated by refreshment messages, or purged if no such messages are received. Additionally, the neighbor map is extended to maintain two backup neighbors in addition to the closest (primary) neighbor. Furthermore, to avoid costly reinsertions of nodes after failures, when a node realizes that a neighbor is unreachable, instead of removing its pointer, it temporarily marks it as invalid in the hope that the failure will be repaired, and in the meantime routes messages through alternative paths. A set of optimizations improve performance by adapting to environment changes. Tapestry nodes tune their neighbor pointers by running refresher threads that update network latency values. Algorithms are implemented to detect query hotspots and offer suggestions as to where additional copies of objects can be placed to significantly improve query response time. A "hotspot cache" is also maintained at each node. Tapestry is used by several systems such as Oceanstore [KBC+00,RW+01], Mnemosyne [HR02] and Scan [CKK00]. Oceanstore further enhances the performance and fault tolerance of Tapestry by applying an additional "introspection layer" whereby nodes monitor usage patterns, network activity and resource availability to adapt to regional outages and denial of service attacks. Pastry [RD01] is a scheme very similar to Tapestry, differing mainly in its approach to achieving network locality and object replication. It is employed by the PAST [DR01] large-scale persistent peer-to-peer storage utility. Finally Kademlia [MM02] is proposed as an improved XOR-topology-based routing algorithm similar to Tapestry and Pastry, focusing on consistency and performance. It introduces the use of a concurrence parameter that lets users trade bandwidth for better latency and fault recovery. In the previous sections we have presented characteristic examples of structured peer-to-peer object location and routing systems, and their main characteristics. A comparison of these (and similar) systems can be based on the size of the routing information maintained by each node (the routing table), their search and retrieval performance (measured in number of hops), and the flexibility with which they can adapt to changing network topologies. It turns out that in their basic design, most of these systems are equivalent in terms of routing table space cost, which is O(logN) where N is the size of network. Similarly their performance is again mostly O(logN) with the exception of CAN where the performance is given by O([d/4]N[1/d]), d being the number of employed dimensions. Maintaining the routing table in the face of transient node populations is relatively costly for all systems, perhaps more for Chord, as nodes joining or leaving induce changes to all other nodes, and less so in Kademlia which maintains a more flexible routing table. Liben-Nowell et al. [LNBK02a] introduce the notion of the "half-life" of a system as an approach to this issue. Overall, these systems present relatively equivalent solutions to routing and location in distributed peer-to-peer environments, focusing however on different aspects and prioritizing differently the various design issues (see also [BKK+03]), and have been adopted by various systems. One of the major limitations of structured peer-to-peer systems is that they are designed to support exact match lookups. One needs to know the exact identifier (key) of a data item in order to be able to locate the node that stores it. To address this issue, keyword query techniques can be designed on top of exact-match queries, although it is arguable whether such techniques can be efficiently implemented [LRS02]. In [GEFB+04] an approach is proposed for augmenting peer-to-peer systems based on distributed hash tables with a mechanism for locating data using incomplete information. The mechanism relies on distributing hierarchically organized indexes that maintain information about the data stored in nodes. A system to support complex queries over structured peer-to-peer systems is proposed in [HHH+02]. This approach relies on the underlying peer-to-peer system for both indexing and routing, and implements a parallel query processing layer on top of it. Files originating from a single site are not usually co-located, meaning that opportunities for enhanced browsing, pre-fetching and efficient searching are lost. They propose an approach towards allowing systems to exploit object locality. Data used by applications is often naturally organized in a hierarchical fashion. The virtualization of the file namespace that takes place as files are represented by keys discards this information. The ability of structured peer-to-peer systems to maintain the structure required for routing to function efficiently when nodes are joining and leaving at a high rate is an open research issue. The resilience of structured peer-to-peer systems in the face of a very transient user population is considered in [LRS02,LNBK02b]. Finally, Saroiu et al. [SGG02] argue that due to the deterministic nature of the topology of structured systems, it is possible for an attacker to construct a set of node identifiers that, if inserted in the network, could intercept all lookup requests originating from a particular node. There are mechanisms for preventing a peer from deliberately selecting arbitrary identifiers, however they can probabilistically be circumvented, if enough addresses are selected. Content replication occurs naturally in peer-to-peer systems as nodes request and copy content from one another. This is referred to as passive replication. A form of replication employed in several systems (e.g. OceanStore, Mojonation, Freenet) is the result of caching copies of content as it passes through nodes in the network. In Freenet [CSW00] for instance, when a search request succeeds in locating a file, the file is transferred through the network node by node back to the originator of the request (see also Section 3.4.1). In the process, copies of the file are cached on all intermediated nodes, increasing its availability and location characteristics in future requests. Active (or proactive) content replication and migration methods are often employed to improve locality of data, as well as availability and performance. Instrospective replica management techniques are employed by OceanStore, on top of extensive caching, whereby traffic is observed and replicas of content objects are created to accommodate demand [RW+01]. OceanStore thus adapts to regional outages and denial of service attacks by migrating data to areas of use and maintaining sufficiently high levels of data redundancy. A similar approach is seen in MojoNation, where additional copies of popular data are made by a central services broker that monitors traffic and requests, and are distributed to peer nodes for storage [Moj03]. Dynamic replica management algorithms are used in Scan to dynamically place a minimum number of replicas while meeting quality of service and server capacity constraints [CKK00]. Such algorithms are designed to satisfy both client latency and server loads by first searching for existing replicas that meet the client latency constraint without being overloaded, and, if unsuccessful, proceeding to place new replicas. Different versions of these algorithms differ in the degree to which replicas are enforced to lie close to the client requesting them. where p is the number of object replicas and qr is the object query rate. By replicating content, data consistency and synchronization issues come up that need to be addressed, especially in systems that allow the deletion and update of content (see also Section 9). Some applications effectively decide to weaken their consistency restrictions in favor of more extensive data replication and higher availability. Replication is of increased significance to systems employing steganographic file storage techniques for encryption, such as Mnemosyne [HR02], as these systems must ensure that enough copies of the files are available to avoid collisions. Such encryption techniques are further discussed in Section 5. Finally mechanisms for trading content, discussed in Section 8, essentially result in an additional form of data replication. In FreeHaven, for example, peers frequently trade and exchange parts of documents (shares) with each other with the sole aim to increase availability and censorship resistance [DFM01a]. Peer-to-peer content distribution architectures present a particular challenge for providing the levels of availability, privacy, confidentiality, integrity, and authenticity often required, due to their open and autonomous nature. The network nodes must be considered untrusted parties, and no assumptions can be made regarding their behavior. This Section discusses various approaches that address a number of security issues characteristic of peer-to-peer content distribution systems. We particularly focus on secure storage, secure routing, access control, authentication, and identity management. Various cryptographic algorithms and protocols are employed to provide security for content published and stored in peer-to-peer networks. Self-certifying data is data whose integrity can be verified by the node retrieving it [CDG+02]. A node inserting a file in the network calculates a cryptographic hash of the file's content, based on a known hashing function, to produce the file key. When a node retrieves the file using its key, it calculates the same hash function to verify the integrity of the data. Note the requirement for common knowledge of the hashing function by all nodes in the network. The above approach is adopted by the CFS system [DKK+01], while PAST uses a similar approach based on signed files [DR01]. Note that the method depends on using the hash-derived signature as a file's unique access key. The information dispersal algorithm by Rabin [Rab89] is widely used. Publius [WAL00], Mnemosyne [HR02], FreeHaven [DFM00] employ the algorithm for encoding information to be published in the network. Files are encoded into m blocks so that any n are sufficient to reassemble the original data (m < n). This gives resilience "proportional" to a redundancy factor equal to [m/n]. Shamir's [Sha79] secret sharing scheme (SHA) is also used in several systems (Publius [WAL00], MojoNation [Moj03] and PAST [DR01]). The publisher of the content encrypts a file with a key K, then splits K into l shares so that any k of them can reproduce K, but k-1 give no hints about K. Each server then encrypts one of the key shares along with the file block. In order for the file to become inaccessible, at least (l-k-1) servers containing the key must be shut down. A mechanism based on publisher, forwarder, storer and client peers communicating through anonymous connection layers is employed by PAST [Ser02]. A publisher selects several forwarders and sends to them via anonymous connection encrypted shares of a file. The forwarders in turn select other nodes to act as storers for the shares, and forward the shares to them (again via an anonymous connection). Once all shares are stored, the publisher destroys them, and announces the file name together with the list of forwarders that were used. In order to retrieve the content, a client will contact the forwarders; the forwarders will in turn contact random servers to act as decryptors for the addresses of the storers holding the shares. The forwarders will then contact the storers requesting the shares. The storers will decrypt the shares and send them back to the client. The process repeats until enough shares are collected to reconstruct the document. Forwarders are visible to a potential attacker, but they are less likely to be attacked since they don't store the content, nor the addresses of the nodes storing the content. The use of smartcards for tracking each node's use of remote resources and issuing digitally signed tickets was also suggested in the PAST system [DR01]. This would allow nodes to prove to other nodes that they are operating within their quota. It is argued however that it may be impractical to issue smartcards to a very large number of nodes, and that the danger of the smartcard keys being compromised by nodes of the network is considerable [Wal02]. A distributed steganographic file system, based on [ANS98] is implemented by Mnemosyne [HR02]. The main property of a steganographic file system is that encrypted blocks are indistinguishable from a random substrate, so that their presence cannot even be detected. The system is prepared by first writing random data to all blocks, and then files are stored by encrypting their blocks and placing them at pseudo-randomly chosen locations (e.g. by hashing the block number with a randomly chosen key). To avoid collisions a considerable amount of replication is required. A mechanism based on erasure coding for data durability and a Byzantine agreement protocol [LSP82] for consistency and update serialization is implemented by OceanStore [RW+01]. With erasure coding the data is broken in blocks and spread over many servers. Only a fraction is needed to reconstruct the original block (similar to the information dispersal algorithm). The objects and their associated fragments are then named using a secure hash over the object contents, giving them globally unique identifiers. This provides data integrity, by ensuring that a recovered file has not been corrupted, since a corrupted file would produce a different identifier. Blocks are dispersed with care to avoid possible correlated failures, picking nodes in different geographic locations or administrative domains or based on models of historical measurements. An "inner ring" of servers is set up for each object to provide versioning capabilities. The role of the ring is to maintain a mapping from the original identifier of the object to the identifier of the most recent version of the object. The ring is kept consistent through a Byzantine agreement protocol, that lets 3f+1 servers reach an agreement when no more than f are faulty. So the mapping from an active (original) identifier to the most recent identifier is fault tolerant. The inner ring is also responsible for verifying the object's legitimate writers and maintaining a history of the object's updates, thus providing a universal undo mechanism as well as true referential integrity by storing previous versions of objects. The goal of secure routing is to resolve the problem of malicious nodes attempting to corrupt, delete, deny access to or supply stale copies of object replicas that are transferred between nodes. Secure assignment of IDs to nodes. Secure maintenance of routing tables. These primitives can be combined with other existing security techniques to yield more robust applications. The issues of access control, authentication and identity management are often ignored in peer-to-peer content distribution systems. Where an access control mechanism is used, it follows the discretionary access control paradigm [And01]; clearly an insecure approach in the face of untrusted clients. Within a distributed environment, it is possible for the same physical entity to appear under different identities, particularly in systems with highly transient populations of nodes. This poses a security threat, especially in peer-to-peer systems that employ content replication or fragmentation schemes over many peers for security and availability (see also Section 5.1), and therefore rely on the existence of independent peers with different identities. This problem is labeled a "Sybil Attack" and analyzed in [Dou02], concluding that unless a central certification or identification authority is employed, peer-to-peer systems will be susceptible to this kind of attack. The only proposed alternative is the use of (typically impractical) resource-demanding identification challenges, which however assume that the resources of the attacker are limited. In several systems the lack of authentication is overcome by the distribution to a subset of privileged users of keys necessary for accessing content. Access control lists can also be assigned to objects by their original authors through the use of signed certificates (e.g. in Oceanstore [KBC+00]). All content modifications relating to an object are then verified against the access control list that is assigned to it, and unauthorized updates are ignored. The issue of peers that often appear with different identities in order to escape the consequences of past actions, and in particular the effects of this on the performance of reputation or incentive mechanisms is discussed in [LFSC03]. Finally, it is argued that access control is closely related to intellectual property management and digital rights management issues. Whether-or which-peer-to-peer systems should enforce access control and to what extent, and whether this enforcement should take place at the endpoints of the network, remains an open issue [DGMY03]. the details of a query for retrieval of the content. This section describes the main approaches currently adopted for providing anonymity. Freenet [CSW00] is a peer-to-peer content distribution system specifically targeted towards providing anonymity to its users by making it infeasible to discover the true origin or destination of a file passing through its network, and difficult for a node operator to determine or be held responsible for the actual physical content of their own node. It employs a mechanism whereby when a search for a file succeeds, the file is passed from the node that holds it to the originator of the request through every node that forwarded the search request. In order to achieve anonymity, any node along this path can unilaterally decide to claim itself or another arbitrarily chosen node as the data source. In this way there is no connection between the requestor of the file and the actual source node. As a further measure, the initial value of the hops-to-live counter associated with each search message is randomly chosen in order to obscure the distance of the message from the originator node. More details about the location and routing mechanism employed by Freenet are discussed in Section 3.4.1. Content distribution systems that seek to provide anonymity often employ infrastructures for providing anonymous connection layers, such as onion routing [GRS99], mix networks [Cha81,BFK98] or the Freedom anonymity system [Fre03]. For instance, the anonymizing, censorship-resistant system proposed in [Ser02] splits documents to be published into encrypted shares and uses an anonymizing layer of nodes (which it refers to as "forwarders") to pick nodes on which to store the shares, construct "onions" around them (as in onion routing) and anonymously forward them including their anonymous return addresses, while the original documents are destroyed. FreeHaven [DFM00] is a similar system built on top of anonymous remailers for providing pseudonyms and communication channels. The Tarzan system [FSCM02] is a completely decentralized anonymizing network layer infrastructure that builds anonymous IP tunnels between an open-ended set of peers. By using the Tarzan infrastructure a client can communicate with a server without anybody being able to determine their identity. The Tarzan anonymizing layer is completely decentralized and transparent both to clients and servers, and it involves sequences of mix relays chosen from a large pool of volunteer participant nodes. Packets are routed through a tunnel of randomly chosen Tarzan peers using mix-style layered encryption, similar to onion routing. The two ends of the tunnel are a Tarzan node running a client application and a Tarzan node running a network address translator. The latter forwards the traffic to the ultimate destination, an ordinary internet server. A suggested policy to reduce the risk of attack to the system is for tunnels to contain peers from different jurisdictions or organizations, even if performance is sacrificed. Crowds [RR99] is a system similar to Tarzan, its main difference being that in Tarzan the data is encrypted in the tunnels, whereas in Crowds it is not. A censorship resistant design based on the Chord lookup service is proposed in the Achord system [HW02]. Achord provides censorship resistance by focusing on publisher, storer and retriever anonymity and by making it difficult for a node to voluntarily assume responsibility for a certain document. The design of Chord is carefully varied so that these anonymity and censorship resistance properties are achieved without altering its main operation. In particular, the Chord algorithm is modified so that the node identification information is suppressed as the successor nodes are located. More details about the Chord Distributed Object Location and Routing system can be found in Section 3.4.2. Deniability in a peer-to-peer content distribution system refers to each user's ability to deny knowledge of content stored in their node. As a consequence users cannot be held responsible for the content stored in their node, or for actions that have been carried out by their node as part of it's operation in the peer-to-peer network. A deniable peer-to-peer system can be used without fear of censorship or repercussions for dealing with particular content, increasing the degree of freedom it provides to its users. On the other hand, it makes the exchange of illegal content less risky and therefore easier as there is less control over the operation of and content stored at each node of the network. Deniability can apply both to content being stored and content being transferred. This feature is offered by systems that store encrypted shares of files and no keys for them, and therefore cannot know the content of the files whose shares they are storing (examples are Publius [WAL00], Oceanstore [KBC+00] and PAST [DR01,Ser02]). Similarly, systems that implement distributed steganographic storage systems (such as Mnemosyne [HR02]) offer deniability through the fact that blocks of files that are written on a peer node's file system are undetectable (cannot be directly searched). This feature can be offered through the use of anonymous connection layers incorporated in systems such as PAST (see also Section 6). It makes it possible to deny that a request from a client node nc had anything to do with a share arriving at nc some time later. In a different approach with the same goal, Freenet [CSW00] offers deniability by making it infeasible to discover the true origin of a file passing through the network (see Section 3.4.1 for a description of the Freenet location algorithm). Furthermore, as files passing through the network are transparently cached at all nodes encountered, it is difficult for a node operator to determine or be held responsible for the actual physical content of their own node. Additional measures for deniability can be incorporated by inhibiting the use of traffic analysis for concluding where a file was read from. For example in Mnemosyne [HR02] during the retrieval of a file more nodes than those needed will be contacted and more files will be retrieved so that the actual file targeted will be disguised. It should be noted that structured systems are apparently non-deniable, as the identifiers of the files stored at the nodes are bound to the node addresses; if a file is known to exist in the network, its location, and therefore the identity of the node that stores it, is also known. On the other hand, the owner of the node has not necessarily requested the file, and in any event has no control over whether the file will be stored in their node, and in this sense cannot be held responsible for it. The operation, performance and availability of an uncontrolled decentralized peer-to-peer system relies to a large extent on the voluntary participation of its users. It is therefore necessary to employ mechanisms that provide incentives and stimulate cooperative behavior between the users, as well as some notion of accountability for actions performed. In the absence of such provisions, the results can range from significant degradation of performance to variable and unpredictable availability of resources, or even to complete collapse. An example of uncooperative behavior is the so-called "free-rider" effect, whereby users only consume resources without contributing any. This can be interpreted as a manifestation of the "Tragedy of the Commons" [Har68], which argues that people tend to abuse shared resources that they do not have to pay for in some way. Providing incentives and accountability in peer-to-peer networks with transient populations of users, where it is hard to identify peers and obtain information about their past behavior in order to predict their future performance, can be a particularly challenging task, especially due to the absence of a ubiquitous, effective, robust, and secure system for making and accepting anonymous micropayments. Trust is a straightforward incentive for cooperation, in which one engages in a transaction based on whether he/she trusts the other party. Reputation mechanisms belong in this category. In trade-based incentive mechanisms, one party offering some service to another is explicitly remunerated, either directly or indirectly. This category is mainly represented by various micropayment mechanisms and resource trading schemes. Online reputation management systems can be described as large-scale "online word-of-mouth communities" in which individuals share opinions about other individuals. Centralized reputation systems (such as the one found in eBay) are successful to a large extent because people trust the reputation information presented by them [Del01]. In a peer-to-peer network, however, there is no single, recognizable organization or entity to maintain and distribute reputation. As a result, reputation information must be itself distributed throughout the network, and hosted on many different nodes. The main goal of a peer-to-peer reputation mechanism is to take the reputation information that is locally generated as a result of an interaction between peers, and spread it throughout the network to produce a global reputation rating for the network nodes. In the process, such reputation information must be kept secure and available. Various complex reputation management mechanisms have been developed to address the above challenging tasks. Kamvar et al. [KSGM03] propose the EigenTrust algorithm, which produces global reputation ratings for users based on their history of uploads. These ratings can then be used by other peers to decide where to download files from. The global reputation values are computed from the local reputation values assigned to a peer by other peers, weighted by the global reputation of the assigning peers. This approach was found to reduce the number of rogue files on the network. Gupta et al. [GJA03] present a partially centralized mechanism using reputation computation agents and data encryption, in which the reputation values are calculated, encrypted and stored locally using a reputation computation agent. They propose two different schemes for calculating reputation values, a credit/debit scheme and a credit only scheme. Xiong and Liu [XL02] present a feedback-based reputation based mechanism where a scalar trust value for a peer is computed based on a figure of the satisfaction received by other peers, the total number of interactions and a balancing factor to counteract reports by malicious peers. The reputation information is distributed in the network so that each peer maintains a portion of the total trust data. Various simple (and to some extent naive) approaches calculate a user participation level [Kaz03] and reward peers with higher participation by giving higher priority to their requests or by reducing their waiting times in file transfer queues. In a more abstract approach [RL03], utility functions based on the amount and popularity of content stored by the peer are used to estimate a figure for their usefulness. Such mechanisms are generally easy to subvert by malicious users. Finally, distributed auditing mechanisms have also been devised to apply peer-pressure to misbehaving nodes [Wal02]. Nodes can consume resources to compare the logs of another node chosen at random with the logs of every node with which it is sharing information. The system appears to provide strong disincentives to cheaters at a reasonable cost. At the development level, peer-to-peer frameworks such as Sun's JXTA [Jxt03] include provisions for incorporating peer-monitoring hooks in a distributed content distribution environment, which could be used for collecting transaction information and building centralized or distributed reputation databases. Some potential problems with distributed reputation management need to be addressed. For example, an entity acquiring reputation in one context where it has functioned well may spend it in another context for malicious purposes. An immediate extension of the above scenario is the possibility of using reputation as currency, exchanging it for content or services. A discussion of accountability and reputation can also be found in [DFM01b]. A variety of both centralized [Moj03,IIKP02] and decentralized [VCGS03,YS03] currency-based micropayment and credit systems have been deployed in peer-to-peer networks. A typical example is the MojoNation system, where a currency (the "Mojo") is gained by offering disk space, bandwidth or CPU cycles, and used to obtain access to distributed storage space. This system employs a scheme based on trusted third parties to ensure honest transactions between peers. It is however claimed in [BAS03] that monetary schemes, although providing clear economic models, may be impractical for most applications. Various decentralized resource trading and exchange schemes have been proposed [AG04,Coh03,CGM02a,DFM00]. Anagnostakis and Greenwald [AG04] proposed an extension to accommodate transitive chains of peer transactions, instead of simple one-to-one exchanges. A system in which each node publishes and digitally signs logs containing lists of files it stores on behalf of remote nodes and lists of files that other nodes are storing on its behalf is proposed in [Wal02]. Through the use of these lists it can be ensured that no node is using more resources than it is providing and a balanced system is achieved. A flexible algorithm for trading content is proposed by Cooper and Garcia-Molina [CGM02a]. Peers make local decisions about how much data to trade, what resources to contribute and how many trades to make. This algorithm ensures fairness while trying to maximize content preservation by choosing the most appropriate policies for deed trading, advertising, remote site selection and bidding. Another example of a purely decentralized reputation system based on resource trading is seen in FreeHaven [DFM00]. The FreeHaven nodes form contracts to store each other's material for a certain period of time. By successfully fulfilling a contract, a node increases its reputation. Contracts are formed whenever new data is inserted in the network, or swapped between peers. A trading handshake protocol is employed. It includes "receipts" for resources traded, and the use of "buddy" peer nodes that record the transactions carried out by other nodes. 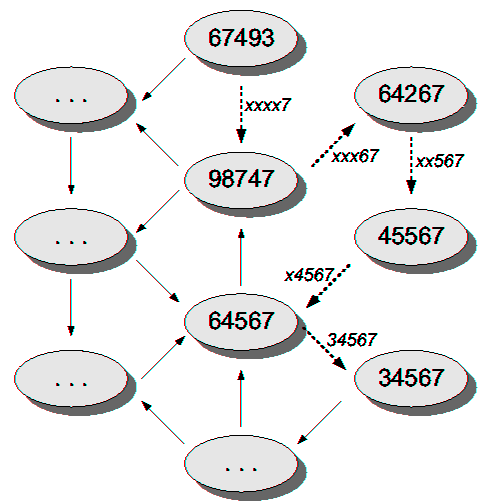 Each node therefore maintains a database containing the perceived reputation of others. Nodes periodically check whether other nodes have dropped data earlier than they were supposed to, and decrease the level of trust of these peers. In order for nodes to leave the network without decreasing their reputation value, they must first swap their documents for shorter-lived ones and wait until they expire. An additional benefit of trading content is that it offers a way of actively replicating it and hence making it more available and less likely to be lost due to failures. Digital libraries may collaborate with one another to provide content preservation by storing each other's material. Systems such as OceanStore [KBC+00] and Intermemory [CEG+99] employ this idea. Finally, it is argued in [CFV03] that such resource trading models are particularly suitable for bootstrapping peer-to-peer economies in the first period of their operation. The resources that peer-to-peer content distribution systems typically deal with are content (files), storage (disk space) and transmission capacity (bandwidth). Obviously inserting, locating (searching) and retrieving content are the minimum operations that any system is required to perform. Additional resource management facilities may include removing or updating content, maintaining previous versions of updated content, managing storage space and setting bandwidth limits. Different peer-to-peer content distribution system allow different levels of resource management, as described below. Deleting and updating content are not straight-forward operations in a peer-to-peer environment if correct synchronization is to be maintained. Systems such as MojoNation [Moj03] use immutable files, which cannot be updated. The only way to update the content is to post a new version of the document under a different name. PAST [DR01] is similar in this respect. It does offer a delete functionality for reclaiming the disc space occupied by a file, but it does not guarantee that the file will no longer be available anywhere in the network. FreeHaven [DFM00] also forbids un-publishing or revocation of documents, but mainly for reasons of security and robustness to attacks. Both deletion and update of content are offered by Publius [WAL00], which is however based on a static set of servers that store the content. Files are published along with a password file that ensures that only the publisher will be able to delete or modify the content. Document expiration dates are effectively introduced in FreeHaven [DFM00] through the use of contracts with different durations, as described in Section 8. A more sophisticated approach is employed by OceanStore [RW+01], which offers a version-based archival storage system. Versions of documents are stored in permanent read-only form, encoded with erasure codes and spread over hundreds of servers. OceanStore maintains active maps of document IDs, which redirect to the most recent version of a document, providing both an update history and an undo mechanism. An entire distributed directory structure system including directories and Unix-like inodes [Bac86] is built on top of files by Mnemosyne [HR02]. Directories are optionally used to aggregate files sharing a common key, serving as a mnemonic service for a set of file names. Searching facilities may also vary in their degree of functionality and performance. Unstructured systems such as Gnutella, Kazaa and FreeHaven offer keyword-search mechanisms that are convenient but do not scale well (see also our discussion in 3.3.4). In structured systems searches are very efficient but can only be based on file identifiers. The problem of providing keyword search facilities on top of exact-match queries is open. One solution proposed in Freenet is the use of indirect files, published along with regular files and pointing to them, which are named according to relevant search keywords. The problem of managing the large volume of such files, however, also remains open [CSW00]. Managing the storage space available to the peers also varies between systems. Usually the amount of disk space contributed can be specified by each peer independently. In systems such as MojoNation users contribute storage in exchange for economic or other compensation. PAST [DR01] uses a secure quota system whereby users are either assigned a fixed quota of storage they can use, or they can use as much as they contribute on their node. This system can be optionally extended to incorporate the use of smartcards. In order to protect from denial of service attacks, apart from enforcing a published size quota to users the idea of "hash cash" is also employed (e.g. in Publius [WAL00]). A publisher is requested to carry out computational work to solve a mathematical problem before being allowed to publish a certain amount of content. Alternatively, a per-node rate limiter can be used, as is for example the case in Mnemosyne [HR02]. Bandwidth management is also available in systems such as Kademlia [MM02], which allows the users to trade bandwidth for latency and fault recovery. The topic of semantic grouping and organization of content and information within peer-to-peer networks has attracted considerable research attention lately [ZDDRH03,APL03,CFM+03,BEH+03], driven to a large extent by the recent advances in the field of knowledge management. Khambatti et al. [KRD03] introduce the notion of interest-based "peer communities", similar to real human communities, in which membership depends on the relationship between peers that share common interests. The authors argue-and show through their experiments-that such communities can be used to make searching more efficient and produce better quality of results. The grouping is implemented through sets of attributes that the peers choose to claim, and communities are formed between peers that share similar attributes. As an extension of this notion, a peer-to-peer community-based trust model is introduced in [KDR04], where links between peers that trust each other are used to form dynamic coalitions between different communities. The semantic overlay clustering approach, based on partially-centralized (super-peer) networks [LWSN03] aims at creating logical layers above the physical network topology, by matching semantic information provided by peers to clusters of nodes based on super-peers. Clusters of nodes with similar semantic profiles are therefore formed based on some matching engine and clustering policy. Each cluster contains a set of peers together with their corresponding super-peer. Bonifacio et al. [BCMN02] propose a distributed knowledge management architecture consisting of knowledge nodes (peers that own local knowledge), that cooperate through a set of services. Each node can act as a seeker (allowing the user to search for information and forwarding queries), as a provider (accepting and resolving queries and returning results) or both. Searching can be either semantic (based on a context matching algorithm) or textual (based on keywords). Groups of nodes have the ability to form federations, similar to social aggregations, by agreeing to be considered as a sole entity by other peers when they request certain semantic search services. A peer-to-peer architecture based on semantic grouping, context and peer profiles applied in the area of eLearning is proposed in [HKK03]. From a different perspective, a number of different mechanisms are proposed for constructing efficient overlay network topologies by taking into account the locality and network proximity of peer computers to decrease the communication cost [ZZZ+04,ZJK02,CDYR02]. Peer-to-peer systems are distributed systems consisting of interconnected nodes, able to self-organize into network topologies with the purpose of sharing resources such as content, CPU cycles, storage and bandwidth. Content distribution, a prominent application area of peer-to-peer systems, is based on systems and infrastructures designed for sharing digital media and other data between users. Peer-to-peer content distribution systems range from relatively simple direct file sharing applications, to more sophisticated systems that create a distributed storage infrastructure for securely and efficiently publishing, organizing, indexing, searching, updating, and retrieving data. We performed this study of peer-to-peer content distribution systems and infrastructures by identifying the feature space of their non-function properties, and determining the way in which these non-functional properties depend on and are affected by various design features. The main non-functional characteristics we identified include provisions for security, anonymity, fairness, increased scalability and performance, as well as resource management and organization capabilities. One of the central characteristics of peer-to-peer systems-which reflects upon issues of performance, availability and scalability-is their ability to function, scale and self-organize in the presence of a highly transient population of nodes and network and computer failures, without the need of a central server administration. This characteristic is mainly attributed to the network organization and location and routing algorithms. Two general categories of systems can be identified in this respect: the unstructured systems and the structured (or DHT-based) systems. The rationale behind structured systems often was to conquer the severe scalability and performance problems of unstructured ones. However recent research developments in both structured and unstructured systems, renders them both as complementary and acceptable solutions. Research on other aspects and properties of peer-to-peer content distribution systems has taken advantage of knowledge and solutions from numerous scientific fields. Characteristic examples include research on the application of reputation systems in peer-to-peer environments, the semantic organization of information, as well as the use of cryptographic techniques for the protection of data, both stored and in transit through the network. The design of new distributed object location, routing and distributed hash table data structures and algorithms for maximizing performance, security and scalability, both in structured and unstructured network architectures. The study of more efficient security, anonymity and censorship resistance schemes. These features will be critical to the future of peer-to-peer systems and their adoption for increasingly more sensitive applications. The semantic grouping of information in peer-to-peer networks. This direction that has a lot in common with efforts in the semantic web domain. The design of incentive mechanisms and reputation systems that will stimulate the cooperative behavior between the users and make the overall operation of peer-to-peer networks more fair. The convergence of Grid and Peer-to-Peer systems. Research in this direction aims to combine the benefits of the established field of distributed computing (including interoperability standards) with the merits of new peer-to-peer architectures. The authors would like to thank the anonymous reviewers for their insightful comments and suggestions. K Anagnostakis and MB Greenwald. Exchange-based incentive mechanisms for peer-to-peer file sharing. In To Appear in the Proceedings of the 24th International Conference on Distributed Computing (ICDCS04), March 2004. PE Agre. P2p and the promise of internet equality. Communications of the ACM, 46(2):39-42, February 2003. Ross Anderson. 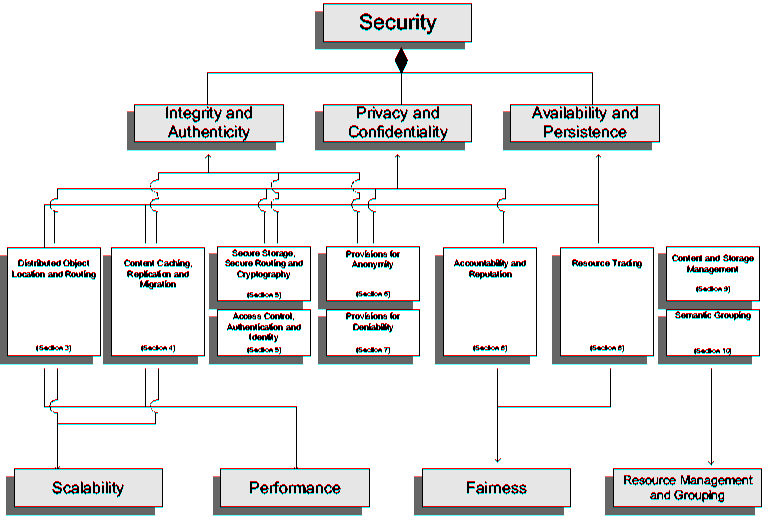 Security Engineering: A Guide to Building Dependable Distributed Systems. John Wiley & Sons, New York, 2001. R Anderson, R Needham, and A Shamir. The steganographic file system. In Proceedings of IWIH: International Workshop on Information Hiding, 1998. S Ayyasamy, C Patel, and Y Lee. Semantic web services and dht-based peer-to-peer networks: A new symbiotic relationship. In Proceedings of the 1st Workshop on Semantics in Peer-to-Peer and Grid Computing at the 12th International World Wide Web Conference, Budapest, Hungary, May 2003. MJ Bach. The Design of the UNIX Operating System. Prentice-Hall, 1986. C Buragohain, D Agrawal, and S Suri. A game theoretic framework for incentives in p2p systems. In Proceedings of the 3rd International Conference on Peer-to-Peer Computing, September 2003. M Bonifacio, R Cuel, G Mameli, and M Nori. A peer-to-peer architecture for distributed knowledge management. In Proceedings of the 3rd International Symposium on Multi-Agent Systems, Large Complex Systems, and E-Businesses (MALCEB'2002), October 2002. J Broekstra, M Ehrig, P Haase, F van Harmelen, A Kampman, M Sabou, R Siebes, S Staab, H Stuckenschmidt, and C Tempich. A metadata model for semantics-based peer-to-peer systems. In Proceedings of the 1st Workshop on Semantics in Peer-to-Peer and Grid Computing at the 12th International World Wide Web Conference, Budapest, Hungary, May 2003. O Berthold, H Federrath, and S Kopsell. Web mixes: A system for anonymous and unobservable internet access. In Proceedings of the Workshop on Design Issues in Anonymity and Unobservability, Berkeley, CA, 1998. P Bernstein, F Giunchiglia, A Kementsietsidis, J Mylopoulos, L Serafini, and I Zaihrayeu. Data management for peer-to-peer computing: A vision. In Proceedings of the Workshop on the Web and Databases, WebDB 2002., 2002. H Balakrishnan, MF Kaashoek, D Karger, Morris R, and I Stoica. Looking up data in p2p systems. Communications of the ACM, 46(2):43-48, February 2003. T Berners-Lee, J Hendler, and O Lassila. The semantic web. Scientific American, May 2001. M Castro, P Druschel, A Ganesh, Rowstron A, and DS Wallach. Secure routing for structured peer-to-peer overlay networks. In Proceedings of the 5th Usenix Symposium on Operating Systems, Boston, MA, December 2002. M Castro, P Druschel, A-M Kermarree, and A Rowstron. Scribe: A large-scale and decentralized application-level multicast infrastructure. IEEE Journal on Selected Areas in Communications, 20(8), October 2002. M Castro, P Druschel, Hu YC, and A Rowstron. Exploiting network proximity in peer-to-peer overlay networks. In Proceedings of the International Workshop on Future Directions in Distributed Computing (FuDiCo 2002), June 2002. Y Chen, J Edler, A Goldberg, A Gottlieb, S Sobti, and P Yanilos. A prototype implementation of archival intermemory. In Proceedings of the Fourth ACM Conference on Digital Libraries, Berkeley, CA, 1999. S Castano, A Ferrara, S Montanelli, E Pagani, and GP Rossi. Ontology-addressable contents in p2p networks. In Proceedings of the 1st Workshop on Semantics in Peer-to-Peer and Grid Computing at the 12th International World Wide Web Conference, Budapest, Hungary, May 2003. B Chun, Y Fu, and A Vahdat. Bootstrapping a distributed computational economy with peer-to-peer bartering. In Proceedings of the 1st Workshop on Economics of Peer-to-Peer Systems, June 2003. BF Cooper and H Garcia-Molina. Peer-to-peer resource trading in a reliable distributed system. In Proceedings of the 1st International Workshop on Peer-to-Peer Systems (IPTPS '02), MIT Faculty Club, Cambridge, MA, USA, March 2002. A Crespo and H Garcia-Molina. Routing indices for peer-to-peer systems. In Proceedings of the 22nd International Conference on Distributed Computing Systems (ICDCS'02), Vienna, Autria, July 2-5 2002. D Chaum. Untraceable electronic mail, return addresses and digital pseudonyms. Communications of the ACM, 24(2):84-88, 1981. I Clake, TW Hong, O Sanberg, and B Wiley. Protecting free expression online with Freenet. IEEE Internet Computing, 6(1):40-49, January-February 2002. Y Chen, RH Katz, and JD Kubiatowicz. Scan: A dynamic, scalable and efficient content distribution network. In Proceedings of International Conference on Pervasive Computing, 2000. B Cohen. Incentives build robustness in bitorrent. In Proceedings of the 1st Workshop on Economics of Peer-to-Peer Systems, June 2003. Y Chawathe, S Ratnasamy, L Breslau, N Lanham, and S Shenker. Making Gnutella-like p2p systems scalable. In Proceedings of the 2003 conference on Applications, Technologies, Architectures, and Protocols for Computer Communications, pages 407-418, Karlsruhe, Germany, 2003. E Cohen and S Shenker. Optimal replication in random search networks. Preprint, 2001. I Clarke, O Sandberg, and B Wiley. Freenet: A distributed anonymous information storage and /etrieval system. In Proceedings of the Workshop on Design Issues in Anonymity and Unobservability, Berkeley, California, June 2000. S Deering. Host extensions for IP multicasting. Technical Report RFC-1112, IETF, SRI International, Menlo Park, CA, August 1998. C Dellarocas. Analyzing the economic efficiency of ebay-like online reputation mechanisms. In Proceedings of the 3rd ACM Conference on Electronic Commerce, Tampa, Florida, October 2001. R Dingledine, MJ Freedman, and D Molnar. The FreeHaven project: Distributed anonymous storage service. In Workshop on Design Issues in Anonymity and Unobservability, pages 67-95, July 2000. R Dingledine, MJ Freedman, and D Molnar. Peer-to-peer: Harnessing the power of disruptive technology, chapter 1. A network of peers: Peer-to-peer models through the history of the Internet, pages 3-20. O'Reilly, first edition edition, March 2001. R Dingledine, MJ Freedman, and D Molnar. Peer-to-peer: Harnessing the power of disruptive technology, chapter 16. Accountability, pages 271-340. O'Reilly, first edition edition, March 2001. N Daswani, H Garcia-Molina, and B Yang. Open problems in data-sharing peer-to-peer systems. In Proceedings of the 9th International Conference on Database Theory, Siena, Italy, January 2003. F Dabek, MF Kaashoek, D Karger, R Morris, and I Stoica. Wide-area cooperative storage with CFS. In Proceedings of the ACM SOSP'01 Conference, Banff, Canada, October 2001. JR Douceur. The Sybill attack. In Proceedings of the 1st International Workshop on Peer-to-Peer Systems (IPTPS '02), MIT Faculty Club, Cambridge, MA, USA, March 2002. P Druschel and A Rowstron. Past: A large-scale, persistent peer-to-peer storage utility. In Proceedings of the Eighth Workshop on Hot Topics in Operating Systems, May 2001. The FastTrack web site. http://www.fasttrack.nu, Accessed on-line 2003. I Foster and A Iamnitchi. On death, taxes, and the convergence of peer-to-peer and grid computing. In Proceedings of the 2nd International Workshop on Peer-to-Peer Systems (IPTPS '03), Berkley, CA, USA, February 2003. I Foster, C Kesselman, and S Tuecke. The anatomy of the grid. Intl. J. Supercomputer Applications, 2001. I Foster. Internet computing and the emerging grid. Nature Web Matters, 2000. P Francis. Yoid: Extending the internet multicast architecture. Unpublished Paper, available on-line at http://www.aciri.org/yoid/docs/index.html, April 2000. The Freedom anonymity system web site. http://www.freedom.net, Accessed on-line 2003. MJ Freedman, E Sit, J Cates, and R Morris. Introducing tarzan, a peer-to-peer anonymizing network layer. In Proceedings of the 1st International Workshop on Peer-to-Peer Systems (IPTPS '02), MIT Faculty Club, Cambridge, MA, USA, March 2002. L Garces-Erice, PA Felber, EW Biersack, G Urvoy-Keller, and KW Ross. Data indexing in peer-to-peer dht networks. In Proceedings of the 24th IEEE International Conference on Distributed Computing Systems (ICDCS), pages 200-208, Tokyo, Japan, March 2004. The genome@home project web site. http://genomeathome.stanford.edu/, Accessed on-line 2003. M Gupta, P Judge, and M Ammar. A reputation system for peer-to-peer networks. In Proceedings of the NOSSDAV'03 Conference, Monterey, CA, June 1-3 2003. The Gnutella web site: http://gnutella.wego.com, Accessed on-line 2003. The Groove web site. http://www.groove.net, Accessed on-line 2003. D Goldschlag, M Reed, and P Syverson. Onion routing for anonymous and private internet connections. Communications of the ACM, 42(2):39-41, 1999. G Harding. The tragedy of the commons. Science, 162:1243-1248, 1968. P Heleher, B Bhattacharjee, and B Silaghi. Are vitrualized overlay networks too much of a good thing? In Proceedings of the 1st International Workshop on Peer-to-Peer Systems (IPTPS '02), MIT Faculty Club, Cambridge, MA, USA, March 2002. M Harren, J Hellerstein, R Huebsch, B Loo, S Shenker, and I Stoica. Complex queries in dht-based peer-to-peer networks. In Proceedings of the 1st International Workshop on Peer-to-Peer Systems (IPTPS '02), MIT Faculty Club, Cambridge, MA, USA, March 2002. R Huebsch, JM Hellerstein, N Lanham, and B Thau Loo. Querying the internet with pier. In Proceedings of the 29th VLDB Conference, Berlin, Germany, 2003. AY Halevy, ZG Ives, P Mork, and I Tatarinov. Piazza: Data management infrastructure for semantic web applications. In Proceedings of the twelfth international conference on World Wide Web, pages 556-567, Budapest, Hungary, 2003. KA Hummel, G Kotsis, and R Kopecny. Peer profile driven group support for mobile learning teams. In Proceedings of the CATE/IASTED Conference, Rhodes, Greece, June 2003. S Hand and T Roscoe. Mnemosyne: Peer-to-peer steganographic storage. In Proceedings of the 1st International Workshop on Peer-to-Peer Systems (IPTPS '02), MIT Faculty Club, Cambridge, MA, USA, March 2002. S Hazel and B Wiley. Achord: A variant of the Chord lookup service for use in censorship resistant peer-to-peerpublishing systems. In Proceedings of the 1st International Workshop on Peer-to-Peer Systems (IPTPS '02), MIT Faculty Club, Cambridge, MA, USA, March 2002. J Ioannidis, S Ioannidis, A Keromytis, and V Prevelakis. Fileteller: Paying and getting paid for file storage. In Proceedings of the Sixth International Conference on Financial Cryptography, March 2002. MA Jovanovich, FS Annexstein, and KA Berman. Scalability issues in large peer-to-peer networks-a case study of Gnutella. Technical report, ECECS Department, University of Cincinnati, Cincinnati, OH 45221, 2001. Technical Report. The Jabber web site. http://www.jabber.org/, Accessed on-line 2003. MA Jovanovic. Modelling large-scale peer-to-peer networks and a case study of Gnutella. Master's thesis, Department of Electrical and Computer Engineering and Computer Science, University of Cincinnati, June 2000. The project JXTA web site. http://www.jxta.org, Accessed on-line 2003. The Kazaa web site. http://www.kazaa.com, Accessed on-line 2003. J Kubiatowicz, D Bindel, Y Chen, P Eaton, D Geels, SR Gummadi, H Weatherspoon, W Weimer, C Wells, and B Zhao. Oceanstore: An architecture for global-scale persistent storage. In Proceedings of ACM ASPLOS. ACM, November 2000. M Khambatti, P Dasgupta, and K Ryu. A role-based trust model for peer-to-peer communities and dynamic coalitions. In Proceedings of the Second IEEE International Information Assurance Workshop, Charlotte, NC, April 2004. V Kalogeraki, D Gunopoulos, and D Zeinalipour-Yazti. A local search mechanism for peer-to-peer networks. In Proceedings of the 11th International Conference on Information and Knowledge Management (CIKM'02), McLean, Virginia USA, November 2002. HC Kim. P2p overview. Technical report, Korea Advanced Institute of Technology, August 2001. D Karger, E Lehman, F Leighton, M Levine, D Lewin, and R Panigrahy. Consistent hashing and random trees: Distributed caching protocols for relieving hot spots on the world wide web. In Proceedings of the 29th Annual ACM Symposium on Theory of Computing, pages 654-663, El Paso, TX, May 1997. M Khambatti, K Ryu, and P Dasgupta. Structuring peer-to-peer networks using interest-based communities. In Proceedings of the International Workshop On Databases, Information Systems and Peer-to-Peer Computing (P2PDBIS), Berlin, Germany, September 2003. Sepandar D. Kamvar, Mario T. Schlosser, and Hector Garcia-Molina. The Eigentrust algorithm for reputation management in p2p networks. In Proceedings of the twelfth international conference on World Wide Web, pages 640-651. ACM Press, 2003. John Kubiatowics. Extracting guarantees from chaos. Communications of the ACM, 46(2):33-38, February 2003. A Keromytis, Misra V, and D Rubenstein. SOS: Secure overlay services. In Proceedings of the ACM SIGCOMM'02 Conference, Pittsburgh, PA, August 2002. Q Lv, P Cao, E Cohen, K Li, and S Shenker. Search and replication in unstructured peer-to-peer networks. In Proceedings of the 16th ACM International Conference on Supercomputing (ICS'02), New York, NY, June 2002. Jintae Lee. An end-user perspective on file-sharing systems. Communications of the ACM, 46(2):49-53, February 2003. K. Lai, M. Feldman, I. Stoica, and J Chuang. Incentives for cooperation in peer-to-peer networks. In Proceedings of the Workshop on Economics of Peer-to-Peer Systems, Berkeley, CA, June 2003. D Liben-Nowell, H Balakrishnan, and D Karger. Analysis of the evolution of peer-to-peer systems. In Proceedings of the ACM Symposium on the Principles of Distributed Computing (PODC), Monterey, CA, July 2002. D Liben-Nowell, H Balakrishnan, and D Karger. Observations on the dynamic evolution of peer-to-peer networks. In Proceedings of the 1st International Workshop on Peer-to-Peer Systems (IPTPS '02), MIT Faculty Club, Cambridge, MA, USA, March 2002. Q Lv, S Ratnasamy, and S Shenker. Can heterogeneity make Gnutella scalable? In Proceedings of the 1st International Workshop on Peer-to-Peer Systems (IPTPS '02), MIT Faculty Club, Cambridge, MA, USA, March 2002. L Lamport, R Shostak, and M Pease. The Byzantine generals problem. ACM Trans. Program. Lang. Syst., 4(3):382-401, July 1982. SM Larson, C Snow, and VS Pande. Modern Methods in Computational Biology,, chapter Folding@Home and Genome@Home: Using distributed computing to tackle previously intractable problems in computational biology. Horizon Press, 2003. A Loeser, M Wolpers, W Siberski, and W Nejdl. Semantic overlay clusters within super-peer networks. In Proceedings of the International Workshop On Databases, Information Systems and Peer-to-Peer Computing (P2PDBIS), Berlin, Germany, September 2003. P Mayamounkov and D Mazieres. Kademlia: A peer-to-peer information system based on the xor metric. In Proceedings of the 1st International Workshop on Peer-to-Peer Systems (IPTPS '02), MIT Faculty Club, Cambridge, MA, USA, March 2002. The MojoNation web site. http://www.mojonation.net, Accessed on-line 2003. W Nejdl, B Wolf, C Qu, S Decker, M Sintek, A Naeve, M Nilsson, M Palmer, and T Risch. Edutella: A p2p networking infrastructure based on rdf. In Proceedings of the twelfth international conference on World Wide Web, Budapest, Hungary, 2003. CG Plaxton, R Rajaraman, and AH Richa. Accessing nearby copies of replicated objects in a distributed environment. In Proceedings of ACM SPAA. ACM, June 1997. MO Rabin. Efficient dispersal of information for security, load balancing and fault tolerance. Journal of the ACM, 36(2):335-348, April 1989. A Rowstron and P Druschel. Pastry: Scalable, distributed object location and routing for large-scale peer-to-peer systems. In Proceedings of IFIP/ACM Middleware, Heidelberg, Germany, November 2001. M Ripeanu and I Foster. Mapping the Gnutella network: Macroscopic properties of large-scale peer-to-peer systems. In Proceedings of the 1st International Workshop on Peer-to-Peer Systems (IPTPS '02), MIT Faculty Club, Cambridge, MA, USA, March 2002. S Ratnasamy, P Francis, M Handley, and R Karp. A scalable content-addressable network. In Proceedings of SIGCOMM 2001, August 2001. L Ramaswamy and L Liu. Free riding: A new challenge for peer-to-peer file sharing systems. In Proceedings of the Hawaii International Conference on Systems Science, 2003. MK Reiter and AD Rubin. Anonymous web transactions with Crowds. Communications of the ACM, 42(2):32-38, 1999. S Rhea, C Wells, et al. Maintenance-free global storage. IEEE Internet Computing, pages 40-49, September-October 2001. I Stoica, D Adkins, S Zhuang, S Shenker, and S Surana. Internet indirection infrastructure. In Proceedings of the ACM SIGCOMM'02 Conference, Pittsburgh, PA, August 2002. A Serjantov. Anonymizing censorship resistant systems. In Proceedings of the 1st International Workshop on Peer-to-Peer Systems (IPTPS '02), MIT Faculty Club, Cambridge, MA, USA, March 2002. The seti@home project web site. http://setiathome.ssl.berkeley.edu, Accessed on-line 2003. D Schoder and K Fischbach. Peer-to-peer prospects. Communications of the ACM, 46(2):27-29, February 2003. M Shaw and D Garlan. Formulations and formalisms in software architecture. In Jan van Leeuwen, editor, Computer Science Today: Recent Trends and Developments, pages 307-323. Springer Verlag, 1995. Lecture Notes in Computer Science 1000. S Saroiu, PK Gummadi, and SD Gribble. Exploring the design space of distributed peer-to-peer systems: Comparing the web, TRIAD and Chord/CFS. In Proceedings of the 1st International Workshop on Peer-to-Peer Systems (IPTPS '02), MIT Faculty Club, Cambridge, MA, USA, March 2002. A Shamir. How to share a secret. Communications of the ACM, 22:612-613, November 1979. C Shirky. What is p2p... and what isnt't. O'Reilly Network, available on-line at http://www.oreillynet.com/pub/a/p2p/2000/11/24/shirky1-whatisp2p.html, November 2000. WT Sullivan III, D Werthimer, S Bowyer, J Cobb, D Gedye, and D Anderson. A new major seti project based on project serendip data and 100,000 personal computers. In Proceedings of the 5th International Conference on Bioastronomy, 1997. I Stoica, R Morris, D Karger, MF Kaashoek, and H Balakrishnan. Chord: A scalable peer-to-peer lookup service for internet applications. In Proceedings of SIGCOMM 2001, August 2001. AB Stubblefield and DS Wallach. Dagster:censorship-resistant publishing without replication. Technical Report Technical Report TR01-380, Rice University, Dept. of Computer Science, July 2001. D Tsoumakos and N Roussopoulos. A comparison of peer-to-peer search methods. In Proceedings of the Sixth International Workshop on the Web and Databases, San Diego, CA, June 2003. V Vlachos, S Androutsellis-Theotokis, and D Spinellis. Security applications of peer-to-peer networks. Computer Networks Journal, 45(2):195-205, 2004. R VanRenesse, KP Birman, A Bozdog, D Dimitriu, M Singh, and W Vogels. Heterogeneity-aware peer-to-peer multicast. In Proceedings of the 17th International Symposium on Distributed Computing (DISC 2003), Sorrento, Italy, October 2003. V Vishnimurthy, S Chandrakumar, and E Gun Sirer. Karma: A secure economic framework for p2p resource sharing. In Proceedings of the 1st Workshop on Economics of Peer-to-Peer Systems, June 2003. M Waldman, Rubin AD, and Cranor LF. Publius: A robust, tamper-evident, censorship-resistant web publishing system. In Proceedings of the 9th USENIX Security Symposium, August 2000. DS Wallach. A survey of peer-to-peer security issues. In International Symposium on Software Security, Tokyo, Japan, November 2002. M Waldman and D Mazi. Tangler: a censorship-resistant publishing system based on document entanglements. In Proceedings of the ACM Conference on Computer and Communications Security, pages 126-131, 2001. IH Witten, A Moffat, and TC Bell. Managing Gigabytes: Compressing and Indexing Documents and Images. Morgan Kauffman, second edition, 1999. L Xiong and L Liu. Building trust in decentralized peer-to-peer communities. In Proceedings of the International Conference on Electronic Commerce Research, October 2002. B Yang and H Garcia-Molina. Comparing hybrid peer-to-peer systems. In Proceedings of the 27th VLDB Conference, pages 561-570, Roma, Italy, September 11-14 2001. B Yang and H Garcia-Molina. Designing a super-peer network. Technical report, Stanford University, February 2002. Available on-line: http://dbpubs.stanford.edu/pub/2002-13. B Yang and H Garcia-Molina. Improving search in peer-to-peer networks. In Proceedings of the 22nd International Conference on Distributed Computing Systems (ICDCS'02), Vienna, Autria, July 2-5 2002. B Yu and MP Singh. Incentive mechanisms for peer-to-peer systems. In Proceedings of the 2nd International Workshop on Agents and Peer-to-Peer Computing, 2003. Jim Zhou, V Dialani, D De Roure, and W Hall. A semantic search algorithm for peer-to-peer open hypermedia systems. In Proceedings of the 1st Workshop on Semantics in Peer-to-Peer and Grid Computing at the 12th International World Wide Web Conference, Budapest, Hungary, May 2003. BY Zhao, AD Joseph, and J Kubiatowicz. Locality aware mechanisms for large-scale networks. In Proceedings of the International Workshop on Future Directions in Distributed Computing (FuDiCo 2002), June 2002. BY Zhao, J Kubiatowicz, and AD Joseph. Tapestry: An infrastructure for fault-tolerant wide-area location and routing. Technical Report UCB/CSD-01-1141, Computer Science Division, University of California, Berkeley, 94720, April 2001. X Zhichen, M Mahalingam, and M Karlsson. Turning heterogeneity to an advantage in overlay routing. Technical Report HPL-2002-126, HP Labs, 2002. X Zhang, Q Zhang, Z Zhang, G Song, and W Zhu. A construction of locality-aware overlay network: moverlay and its performance. IEEE JSAC Special Issue on Recent Advances on Service Overlay Networks, January 2004.